Every year in our cities and towns, thousands upon thousands of trees and the billions of board feet they contain are thrown away as garbage. What isn’t dumped in landfills is buried on construction sites, ground up for mulch, or cut into firewood. At the same time, we pay dearly at lumber yards and home centers for many of the hardwoods and softwoods we continue to burn, bury, grind, and throw away. Our forests cannot be treated as an inexhaustible source of timber. Along with sustainable forest management, we must make better use of wood from other sources, like the trees that grow in our own yards, parks, and even near our city streets. As we see it, every urban tree we use for lumber is one less tree that must be cut from our forests and one less piece of green waste that would be dumped in our landfills. Everyone we talk to about harvesting urban timber is enthusiastic about the idea. We hear from people all over the world who want to know what they can do in their local cities and towns to help make a difference. You’ve just taken your first step. 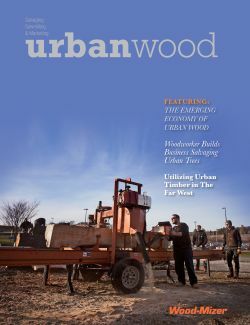 Download the Salvaging, Sawmilling, and Marketing Urban Wood Guide for more information.